Justin, Tim and Mary Harmon in their Guilford home. A big increase in opiate overdoses nationwide has focused attention on substance abuse. Nine out of ten adults suffering from addiction said they began using drugs or alcohol when they were adolescents. In the first of a three-part series on youth battling addiction, WNPR introduces you to the Harmons of Guilford. "I don't think we realized what a serious problem it was until he nearly died." The walls in their home are covered with family pictures. Mary Harmon looked at a photo hanging in the front hallway. She pointed out each of her eight children standing near the Guilford docks. "This is Katherine," Harmon said. "We’ll go in age order. Mary Kim, and then Mark, and then Emma, Claire, Molly. This is Elizabeth, and Tim. We have two boys, and six girls." The Harmons call their youngest Timmy -- he’s 20 years old now. His siblings doted on him from the day he was born. Their other son, Mark, rejoiced when he learned he was no longer the only boy in the family. They describe many happy memories in their home, and some sad. It was the fall of 2011 when the family was confronted with a new challenge. Mary Harmon is a nurse, and had gotten up early one day to go swimming before heading to work. She said, "I heard something I had never heard before in my home. It was coming from Tim’s room, and I heard this very terrible bubbling noise, with groaning." Harmon recalls how ashen Tim looked, and how she went into autopilot, immediately beginning CPR. One of her children called 911. The paramedics arrived soon after, and were able to revive him, and take him to the hospital. When they got there, Harmon remembered her nursing supervisor meeting them at the door. Harmon said, "Timmy had coded again. He had died again. And she said, 'Do you want to be with him?' I said, 'Yes.' She walked back into the room, and she brought me to him. He had been intubated, and they were pushing drugs to try to get a pulse back, and a blood pressure. I held his hand, and said, 'Tim, it’s not time to go, it’s not time to go. It’s Mom, and we need you back with us.'" Tim told her later that he had heard her calling him back. He spent a few days in the ICU, recovering fully. That’s when the tough conversations began. Tim's father, Justin, said, "I don’t think we realized what a serious problem it was until he nearly died." The Harmons had heard that members of his swim team had been experimenting with drugs. "We thought he was experimenting," Justin Harmon said. "We believed it was at the level of marijuana. In fact, it turned out he lost inhibitions with using marijuana, and he would then experiment with much more dangerous drugs." Tim Harmon said he remembers feeling good when taking a prescription painkiller. He recalled, "I actually remember when I broke my ankle getting prescribed Percocet, and really liking that, how it made me feel." The National Institute on Drug Abuse published a study that lists where youth get prescription drugs. 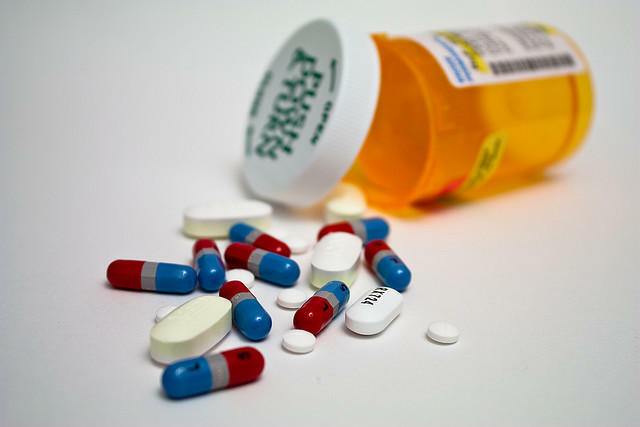 Many get the drugs from prescriptions, but most are given by a friend or relative. 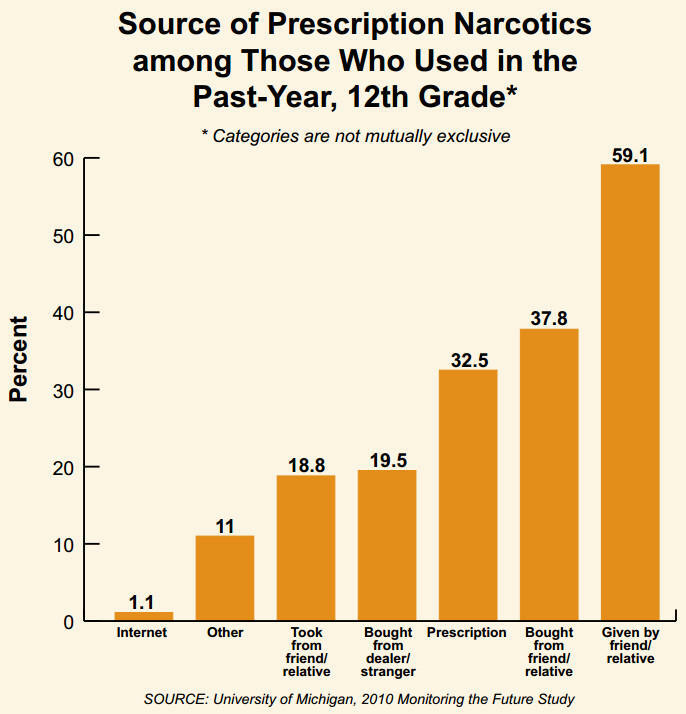 A NIH study from October 2011 showed how young people get prescription drugs. Tim said he started using marijuana in the summer before ninth grade. After meeting his best friend, who he called the "biggest pothead he knew," he said they smoked daily, and often. On the day he overdosed, Tim Harmon remembers snorting two morphine pills, and then he smoked pot. Later, he met up with a friend, and they took K2, or spice -- synthetic marijuana. Before he went to sleep, Tim took more morphine. Looking back, Tim said many of his classmates used marijuana, or did other drugs. He said he used drugs to deal with stress. This wouldn’t be the last time Harmon went to a residential rehab program. In our next story, the Harmons share how they found help for their son at one of the only adolescent treatment facilities in the state. 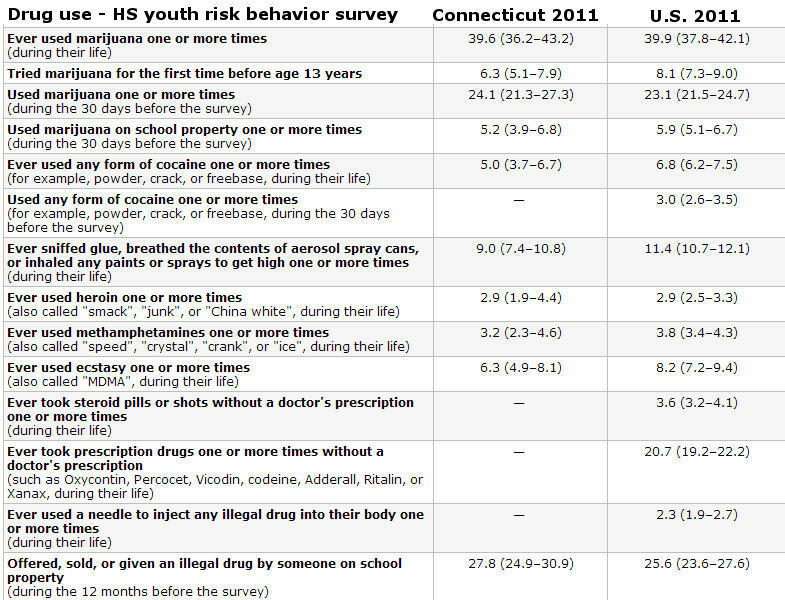 One out of every 22 Connecticut high schoolers has taken medication such as painkillers that weren’t prescribed for them, according to the National Survey of Drug Use and Health. In the second of a three-part series, WNPR looks at treatment options available for local teens with substance abuse issues. Over the last six years, heroin use nationwide has nearly doubled. In Connecticut, attention has focused on the city of Torrington, where there are reports of multiple fatalities last year from heroin overdoses. To some it’s "smack"; to others, it’s "tar." But the majority of us know it as heroin, the dangerously addictive opioid drug that has claimed countless lives across the nation. Less than a week ago, 46-year-old actor Philip Seymour Hoffman died from a heroin overdose in his Manhattan apartment. Sadly, he’s just one of many creative minds lost to addiction. Singer-songwriter Janis Joplin was 27 when an overdose took her life. Frankie Lymon was 25. But heroin isn’t just a celebrity drug. Its use spans the country -- particularly in northeast states, like Connecticut, where it has become a growing problem among teens and adults.